In a previous post, Income Annuities: Immediate and Deferred, I discussed the problems that single-premium immediate annuities (SPIAs) and deferred income annuities (DIAs) can solve and I included the two charts below. These two problems are also considerations in deciding when to claim Social Security benefits. 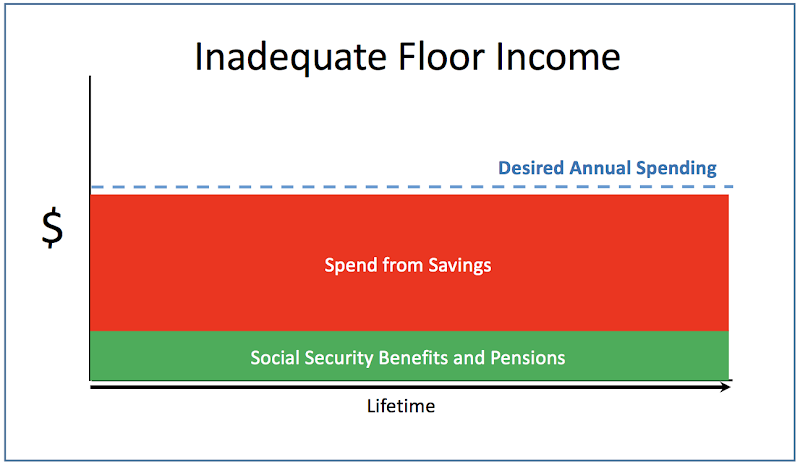 The first chart demonstrates the use of an immediate annuity to increase the floor of safe income for retirees with otherwise inadequate Social Security benefits or pensions. (By “safe”, I mean income generated by assets that are not subject to market volatility. No asset is completely safe.) These are households that need safe income as soon as they retire. Chart 1. Inadequate safe income throughout retirement. The second chart demonstrates the use of a DIA to mitigate the risk of declining wealth late in retirement, should the retiree live that long. 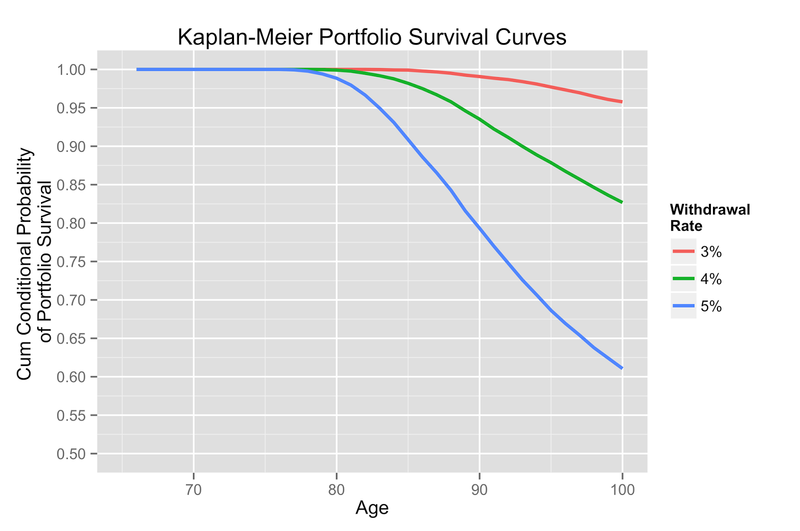 This declining wealth could be the result of a failing portfolio, for instance, though as this chart shows, portfolios rarely fail before age 80. Loss of standard of living can also result from an increase in expenses late in retirement even if the portfolio is successful, or it can be the result of a combination of portfolio losses and increased expenses. In either case, the DIA can mitigate the risk of a loss of standard of living later in retirement. What does this have to do with Social Security benefits? A lot – Social Security retirement benefits are a deferred income annuity, the premiums for which are effectively paid from our FICA taxes. We can begin the benefits payout at age 62 or defer those benefits up to age 70. I discussed the trade-offs between deferring benefits or claiming them early in Delaying Social Security Claims (or Not), but here’s a quick review. We can increase our monthly Social Security retirement benefits by about 8% for each year we defer them up to age 70. This can ultimately result in receiving a check that is 32% larger when claimed at age 66 rather than age 62 and up to 76% larger when benefits are postponed from age 62 to 70. If we spend from an investment portfolio to provide additional income while postponing benefits (instead of working longer, for example), we may increase sequence of returns risk at the worst time, early in retirement. Over-savers might not see a significant increase in sequence risk but retirees with smaller portfolios probably will. In exchange for taking these risks, we can receive much higher total lifetime benefits, perhaps hundreds of thousands of dollars more, in the event that we live to an old age. In this way, we are mitigating the risk of scenarios shown in Chart 2 above (declining wealth and/or increasing expenses in late retirement). By claiming benefits at age 62, we are mitigating the early-retirement risks of scenarios with inadequate safe, floor income as shown in Chart 1. There are a few common strategies for claiming Social Security benefits. One, the “break-even” strategy, suggests that a retiree claim benefits early if they don’t believe they will live past the age when the total of the (fewer) larger benefits overtakes the total of more, smaller benefits. There are several problems with this strategy, the largest being that many healthy people seem to believe they know how long they will live with very little evidence to support that belief. (They are overconfident.) The second problem with break-even analysis is that it doesn't consider life expectancies and it's easy to underestimate the probabilities of surviving to the break-even age. Here's an example from Brian O'Connell at US News and World Report. "The breakeven point, when the total dollars received by waiting until age 66 begin to exceed total dollars received by beginning at age 62, is approximately age 77," he adds. "Life expectancy tables show that a person who has attained age 62 will live to be 85.5, and a person who has attained age 66 will live to be 86.2. This means that if you have a normal life expectancy, you will end up with less dollars received [by claiming at 62]." I often hear retirees say things like, "But I'd have to live 15 more years just to break even!" In fact, the probability that a 62-year old male will live 15 more years to age 77 and profit by delaying claiming is about 72%, meaning that there is a 72% chance that he would lose the break-even bet by claiming at age 62. A second common strategy, advocated by many Social Security optimization tools, is to postpone claiming benefits as long as you can to maximize lifetime benefits in the event that you live a long time. This is a “safety first“ strategy and one I prefer to guessing how long I will live.